Following the dental procedures performed on me by Theresa F. Keefe, DMD, I began to feel very ill. In October of 2000, I began to experience frontal headaches and severe fatigue with drenching nightsweats, so I asked my sleep disorder doctor for an MRI at UConn Health Center. During this visit, I also showed my doctor what felt like very hard veins that started at the bottom of my right jawbone and went down the side of my neck. He told me that this was fibrin. My doctor then told me that there was nothing mentioned in the radiologist's report about this potential mandibular lesion and that perhaps it was an artefact. I was not worried. 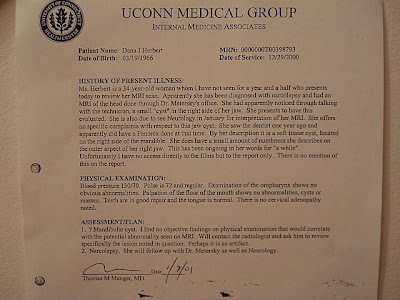 I knew that Dr. Keefe taught dental classes at UConn, I had listed my doctor's name at UConn in her new patient registration form, and she had promised me that there was no pathology in my jawbone before placing the bridge in my mouth. If she had made a mistake, surely she would be notified and call me in to her office fix her mistake. Right? I had complete faith in our conventional health care system! By this time, I had finished painting Dr. Keefe's living room and dining room (in a beautiful gold on cream damask design), and still had to paint her very large two story foyer to pay for the dental work she performed on me, but my health was spiraling downhill, and fast . . . .